The Powerball number will symbolize the amount of days until Christmas Morning!! Each day it will drop one number as we get ever closer to Santa's arrival!! The POWERBALL will start at $100.00 and grow by 2 bbs each game it isn't hit in the Captain's Quarters room! The Powerball balance will carry over the next day so there is no telling how BIG it can GROW!! On December 1st - power ball is I-24 (24 days until Christmas) and it will drop one number until we've reached that Magical Day!! Make this Christmas like no other and play for the chance to win $50,000 in the Christmas Bingo Room. On Christmas Day at 11:00 PM ET we will play the Christmas $50,000 Coverall minimum $10,000. Card cost for this game is $5. But that's not all; we start the fun at 8:00 PM ET with three $1,000 Guaranteed Games every hour on the hour. Card Cost for the $1K Guaranteed Games are at $2. Share Christmas Day with us this year in the Christmas Bingo Room and play for $50,000! Let's give Santa a break. It's your turn to Ride with the Reindeer in the Tourney Room every Saturday Night in the Month of December 8pm-12am ET. We will be offering more BBs on our Reindeer Races for this special. Pick a number from 1-15 and type it in the space provided by going to My Account/Chat Games/Big Races and click update. All players who wish to be eligible for any wins must purchase at least 2 cards per Race game. Winners of Races do not need to be in chat. Rules for Races are as follows: If your chosen number and all the numbers going down its row are called and come in 1st, 2nd, or 3rd, you're a winner!! For example, if you chose number 1, then 1, 16, 31, 46, 61 would be your numbers. Santa Claus is starting to make a list of all what he needs to pack for Christmas Eve. Lots of bingo bucks, bonus prizes, cash rewards and specially designed bingo games were included, but a few bingo games with fixed CASH prizes were left out! Take an advantage of our 2 hour special with games featuring up to $25 in cash and the possibility to get a $100 award! The Grinch stopped by at the Quarter's and stole the prizes from the Jack in the Box patterns We couldn't let that happen! Win the pattern and get an instant $25 bonus! get the details on the promo page. The good book states that three Wiseman were guided to the place where the new born king was born, by a star that powerfully shined in the orient. The star now shines for you in Quarter's stream and brings instant prizes, plus a chance for you to participate in our $150 shared giveaway! Cookies chase $25 and Snowboarding doubles up with $50! Candy Canes drip $100 and the Music Note sings $75 and more! Dec 25 comes at $150 every hour and so does the X Mas Tree at $100! The Xmas Bell rings $50 and the Cent multiplies to $25! Follow them too for another $800! the $150 Poker Play Off at the Casino! Christmas Room We will be letting you the players, choose who you would like to share some holiday cheer with this holiday season. Join us in the Christmas Bingo Room on Tuesday, December 21st, 11am-4pm ET. Once a player (who is in chat), wins a bingo game, they pick a player (who is also in chat) and gives to the CM. The CM will have a number board with amounts hidden from 2-20 BBs. The amount hidden under the number they won on, both the game winner and their chosen player will receive. Example: The bingo winner won on B15, hidden under that number were 20 BBs, both winner and player receives 20 BBs each. Once a number is won on, it can not be used again. To qualify for BBs the winner of the bingo game MUST have been in chat at the beginning of game they won. The winner of the bingo game has to be in chat and give the CM their chosen Roomie. The Roomie MUST have purchased minimum 1 card for that game and answer in chat to the CM to be eligible. The winner of bingo has until the next game begins to answer to the CM. If they do not give their choice of Roomie by this timeframe, they forfeit their win. The Roomie winner chosen must answer once they are picked by the bingo winner. If they do not when the CM calls their name, they will forfeit their win as well and another Roomie is chosen. If more than one bingo winner per game, they may not choose the other bingo winner as their chosen player or can bingo winners choose the same player for the same game. We are digging deeper during the month of December for some bigger Gifts! So grab your shovels and let the fun begin. This special will be too exciting to miss. Join us in the Diamond Room Every Thursday in December 8pm-12am ET and dig some snowballs. Play Hide and Seek for up to £5 guaranteed cash at Jackpotjoy! Christmas is a time for games, and the Queen's organised a grand game of Hide and Seek - for guaranteed cash! It's easy to take part! * Come back the next day when they will confirm how much cash each character was hiding! So don't let a win stay hidden from you this Christmas, join in the royal game of Hide and Seek for a guaranteed cash prize! From December 10th to the 23rd we will have $50 games and a $2,500 Jackpot playing once an hour on the Snow Flake pattern from 10am to 10pm EST. Furthermore, on December 24th, 25th and 26th there will be $100 cash prizes and a $2,500 Jackpot playing once an hour on the Christmas Tree pattern from 10am to 10pm EST. Finally, on December 24th, 25th & 26th there will be a $500 Must Go Game playing on the Candy Cane pattern at 5pm EST. Should take on the Slots... and win some of the $3,500 on the Charmed Reels and the Aces High Bonus Slots! Try my hand at Poker... could get lucky with $500 on the 1st Tourney! Do the Numbers Game in the Chocolate Room every hour. Hope to strike some of the $50 guaranteed jackpots and win some extra deposit bonuses too! Pop in to the Saphire Room at 8 PM... to pick up the special jackpots and BBs on the 90 Ball Star Galaxy! Keep myself free between 6 AM and 11 AM every evening... not going to miss out on any BBs at the chat specials in the Chocolate and Saphire Rooms! Must try my luck at the $2,500 Week 2 Cash Raffle... or would the $25,000 December Delight be a better option? I'll do a $75 deposit right away and let Live Help know too! All the snow has got them feeling very festive at Virgin Bingo. That’s why this week; they’ve laid on a cracker of a promotion! Wager £10 on Bingo tickets from Monday 6th – Sunday 12th December, and they will enter you into one of 3 prize draws to win either a Christmas hamper, £200 of Hamley's vouchers OR a tidy £20. Christmas is the best time of the year, to show our love and appreciation to others by sharing all kinds of gifts with them. Could be cards, chocolates, video games, or even fast cars. Whatever the gift may be, the most important part of giving is to put some love on it! At Bigtimebingo.com we wanted to join the celebrations, so we took some time to think on what would be nice to give you. We wanted something extra fun and that increases your winning chances. Suddenly... bam! 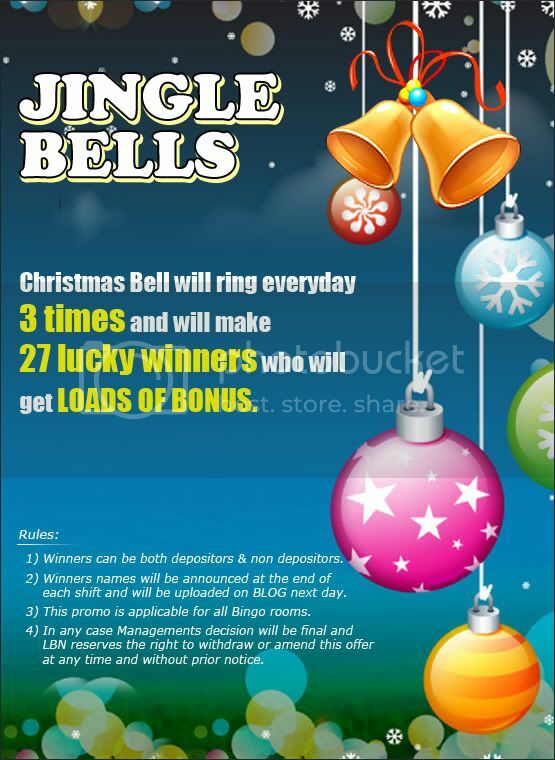 The idea of having 12 special games to fill out your "stocking", before Christmas day came to our mind and the result was nothing but a complete set of bingo promotions, with more than $1,000 in total CASH prizes, packed with the exciting bingo fun you already know! The fun starts on Monday 13th! What's your favorite Christmas color? When speaking the language of bingo colors, Red, Green and Gold are within the favorites, specially this time of the year. Join CM Mistletoe this Tuesday, Dec 14th from 10:00am to 11:00 am and play one of the most popular chat games in our list. Colors! How to play Colors? Pick a color of a bingo ball, red, green or gold (yellow). The last number called determines what color wins. All chatters that have chosen the color of the last number will type (chosen color+ star) to win 10 BBS. If we are missing a letter in the pattern we will play Nabors, if not, CM Coco will call for words. Good luck to all! Crown Bingo (NO USA) have an advent going on at the moment. There is a special deal for every day up to 25th December. Today's special Christmas advent offer is 50% cashback. December 15th is a Christmas Party (no other details available). I can't look at any others so you'll need to go to the website every day to have a look. Just find this picture on their homepage and click it for all the details.